Recently I became aware of the EDH “tier list” over on Tapped Out. I shouldn’t say I just became aware of it, because I had known of its existence, but it was recently updated and I started processing the information therein. It turns out that of the EDH decks I have constructed, the highest tier general is Reaper King, being a tier 2 commander. Locust God is tier 2.5. The others are tier 3 (which is considered “average” or lower, and that was surprising. Some of my decks felt like they would perform better than their given tier, but of course this information is pretty subjective and it depends on the pod you’re playing in. Regardless, a tier 1 commander deck should function better than a tier 3, despite the amount of money thrown at them. That said, I started thinking about how I’d like to have a higher tier deck. It turns out that two of the decks I have under construction are actually high tier. Alesha, Who Smiles at Death is a tier 2 general, while Kess is a tier 1. Looking at the list, it seems that some of the generals in my playgroup were higher tier that I first believed, with my friend’s Ghave deck being tier 2 as well, which it definitely performed as during that recent commander event we went to. This brings us back around to the makeup of the pod, where I was his only real competition and the people we were playing against were pretty useless to help bring him down. With all that in mind, I decided I wanted to go to the top of the list. It’s tax return season, and I knew I’d have a bit of money to throw at this so I had a decision to make: build Kess who I already own or build another of the tier 1 generals. After careful consideration, I decided to build a new deck because I still am unsure about how to win with Kess, but the commander I picked was a shoo-in for my style of play, along with being something I could upgrade an existing deck into. You may or may not remember a post I wrote about revamping the first precon I ever purchased. Daxos, The Returned was a great leader for this deck, and the enchantment focus was fun though the deck was never very competitive. 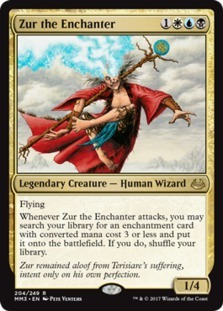 Zur the Enchanter is a commander I’ve had my eye on for a long while, and it just so happens that a large portion of my Daxos deck would fit into his playstyle — plus I’d be able to add blue to the mix which means even more enchantments to choose from! Zur has Daxos beat with his abilities — he’s a 1/4 flyer for 4 mana, but every time he attacks he can tutor up an enchantment with CMC 3 or less, and it goes straight to the battlefield! This is great news, because a majority of the tools we’re going to want to use fit that CMC restriction. The majority of these enchantments will be used to pillow-fort; that is to help keep us protected because we won’t be running many creatures in the deck. So there are a few ways to win here. It seems that most people will use Zur’s ability to tutor up several enchantments to voltron up and go for commander damage eliminations. Using something like Steel of the Godhead gives him unblockable, so you put your opponents on a timer. Giving him a larger boost is possible with Ethereal Armor and a bunch of enchantments on the board, or you can alternatively use Empyrial Armor which gives him +1/+1 based on cards in hand, which combos nicely with Necropotence. If you have no max hand size, you can theoretically use Necropotence to draw a shitload of cards and swing for kills especially if he’s unblockable. You can quicken the pace if you enchant him with Pyresis – 10 poison counters come faster than 21 commander damage! One trick I found was to use Reconnaissance to protect Zur, by triggering his on-attack tutor effect, then pull him back out of combat which will allow you to get the pieces you need out first and then you can go for the kill. Lastly, if combo pieces are destroyed and you have nothing else going for you, try Starfield of Nyx, which makes all existing enchantments */* creatures based on their CMC, so perhaps you can go wide for the win. So what about other creatures? Typical of a control deck, there is plenty of removal and counterspell effects in the deck. I’ve also added more recursion in Replenish, Open the Vaults and Crystal Chimes. Additional tutor effects, such as Plea for Guidance will help if I don’t have Zur out at the time or want to fish up several enchantments at once. One card, Muddle the Mixture has a neat effect called “transmute” where you can pay a small mana cost and discard the card to tutor up something with a particular CMC. In this case, I can tutor up any 3 CMC card which could come in handy in a pinch. Lastly, Stronic Resonator can allow me to trigger Zur’s ability twice per combat, and each enchantment I cast will come with a 4/4 Angel token if I have Sigil of the Empty Throne on the board. All in all, I think this deck is primed to go off and I can’t wait to see it do so!